The Windows insiders must be having a field day right now since Microsoft released Windows 10 build 14361 to their insider team. The Redmond giant apart from making available the regular Windows fixes, incorporated various changes to its famous Linux subsystem which runs Ubuntu on Windows 10 and they listed the changes which are highlighted by the newly added Pseudo Terminal support. 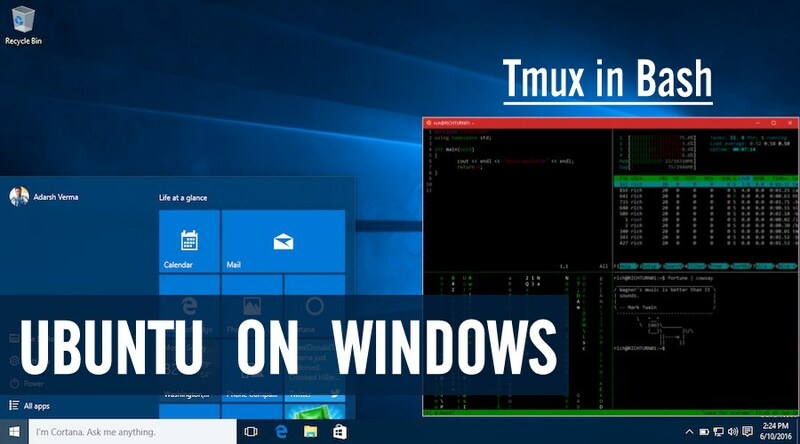 Yes guys, Windows now has Tmux support. For the sake of users who are unfamiliar with Tmux, Tmux is a command line tool that allows users to divide a terminal window into multiple panes, allowing users to switch between panes and easily render the output within each pane. How to install and use Tmux on Ubuntu on Windows? 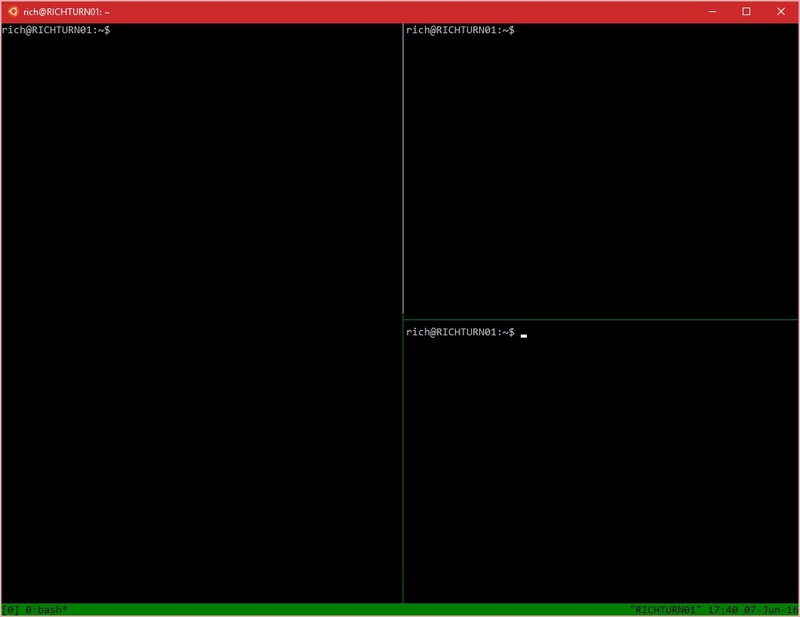 Next, start Tmux by running tmux command. A status bar will appear on the bottom of your Bash screen as can be seen in the image below and clear your screen area. If you see that then you are set for take-off. Vertically split the screen by pressing CTRL B + %, and CTRL B + ” to split the newly created pane horizontally. If you want to navigate between the panes use CTRL B + Arrow-key P N.
This isn’t all. 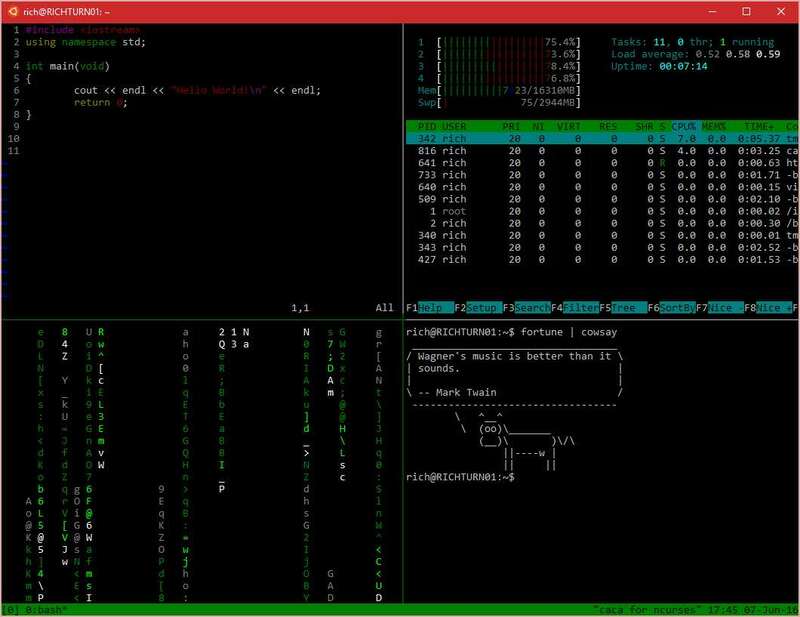 Tmux can perform a whole lot of other operations, allowing users to create terminals that are multi-paned and populate them with customized dashboard tools. The new Bash on Ubuntu on Windows 10 is also now case sensitive in DrvFs as it now recognises the difference between hello.txt and HELLO.TXT. The connection to 0.0.0.0 and :: as localhost is now allowed and users can chmod and delete read-only files from DrvFs. It should be noted that an unexpected behaviour may occur while using case sensitivity outside Bash on Windows. Now Bash on Windows users can also chmod and delete read-only files from DrvFs. The connection to 0.0.0.0 and :: as localhost is also allowed. If you’re interested in reading the complete list of changes included in Microsoft’s Ubuntu port, visit their page here.